For parents, trying to find the most appropriate toy for their child can be a tedious task. 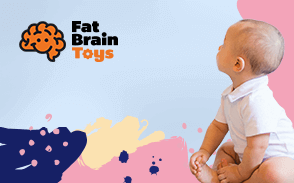 When it comes to finding the perfect toy, you have to think of what will be not only age-appropriate for your child but also what benefit will these toys have on your child’s development. Research has shown that toys like building blocks are particularly beneficial for children between the ages of 18 months to 3 years old because they help younger children master motor skills, develop cognitive skills, especially simple problem-solving skills, and foster spatial intelligence. It also starts to establish the beginning sense of identity. Plentiful blocks to play with. Building blocks are both developmentally beneficial and loads of fun. We've transferred this guide over to our new format to allow you to view numerical ratings and specified criteria to evaluate when considering each product! For this update, we made our original top 15 list, to the top 10, of what products are currently available in today's market. We went a little bit more indepth about the benefits of buying building blocks for your child and why they are educational for your child's development levels. Some pieces might fit loosely. 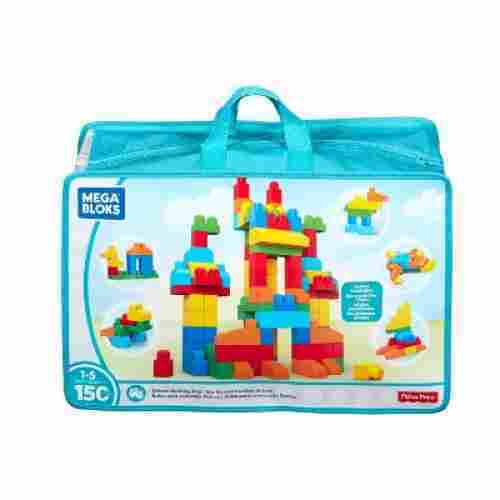 Think of it as a mega LEGO building block set and you now have the First Builders Big Building Bag. Like all building block toys, this is excellent for stimulating open-ended and creative play. 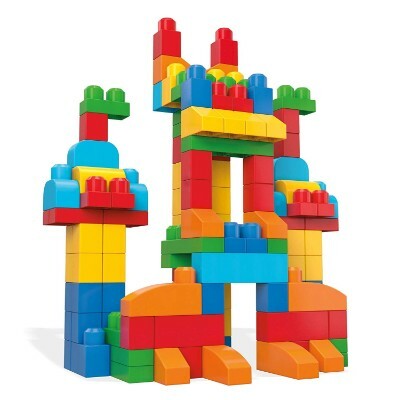 The set comes with 80 large building blocks in various shapes and colors. The blocks are made of the safest high grade plastics to make sure that it won’t harm young children. 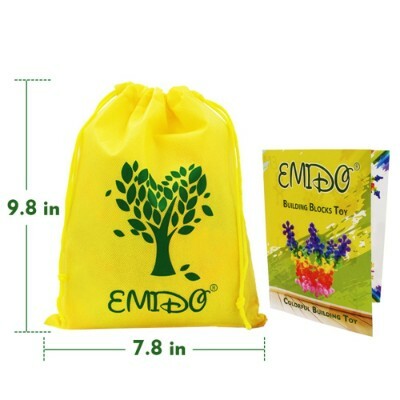 It also comes with a clear storage bag that is, itself, free from PVC and BPA as well as the fact that it is non-woven. 1 to 5 years old. This set is a great way to stimulate your child’s hand-eye coordination development as they continually grasp and handle the blocks. 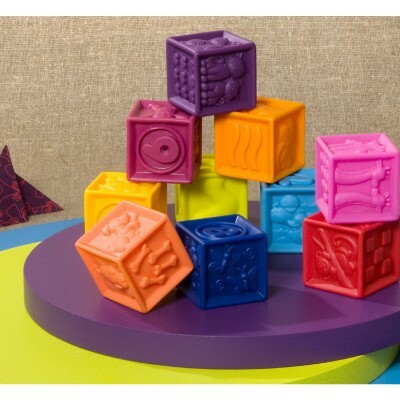 This set of blocks comes with multiple shapes and colors, which is just what your toddler needs to develop their ability to differentiate between similar objects. By playing with these colorful blocks, your child will hone their ability to interpret object details. Being able to identify key differences in shapes, colors, and sizes is an important life skill that is best developed early. Safe and soft to use. Moisture retainment could cause mold. 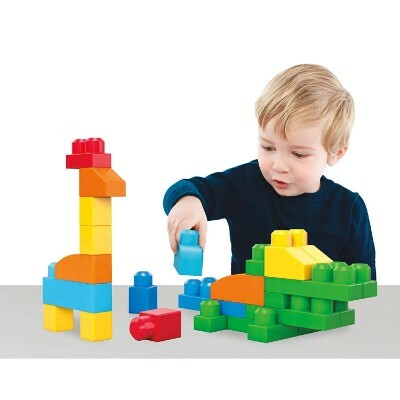 Who says that building block toys can only be enjoyed in the play area? With the Floating Waterproof Foam Blocks, toddlers can now have all the fun in their lives playing with these colorful and buoyant building blocks right in the bathtub or even in the kiddie pool. The set comes with 16 blocks in different shapes and sizes, a mesh tote, a base board, and 2 yellow duckies to make bath time more fun. To build on water, kids will use the buoyant base board as foundation for the building blocks. At least 3 years old. Building on unstable ground can be tricky. Now imagine the challenge of building a structure on water. 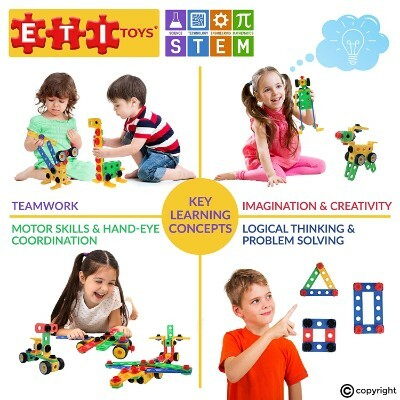 The toy offers unique challenges to help stimulate problem solving skills and critical thinking skills. Older toddlers will have to think of ways on how they can stabilize the blocks on the base board. The Non-Toxic Floating Waterproof Foam Building Blocks is a great way to develop your child's imagination and teach problem solving skills. The toy block set will help your child to learn how to problem solve as they figure out how to keep the toy blocks afloat and stacked upon each other. Such problem solving will help flourish your child's imagination as they invent unique ways for the toy blocks to work together. The toy block set is great for water activities such as bath time or a day at the pool and can be easily cleaned after use. 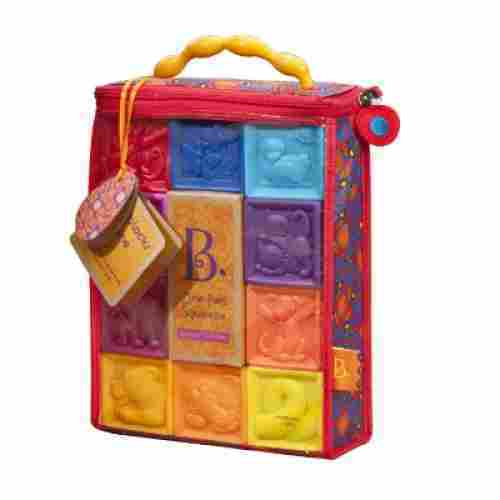 The toy block set is safe and soft to use and its buoyancy will help keep your child afloat as well. mido has modernized the classic building block toy by shaping it into a circular geometric figure rather than the typical square. 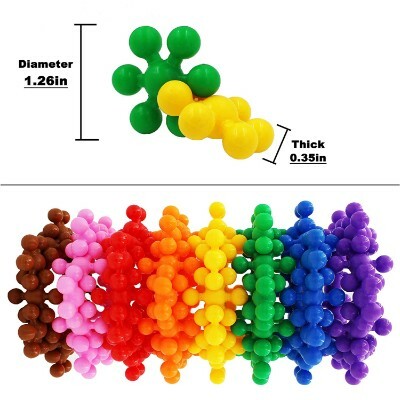 This set comes with 120 brightly colored pieces that easily snap together to allow your child to build whatever comes out of their imagination. All of the pieces arrive in a yellow reusable bag, which will also store the pieces when your child is not using them. Each piece 0.35 inches wide, which makes them thick enough to easily be grasped by tiny hands. 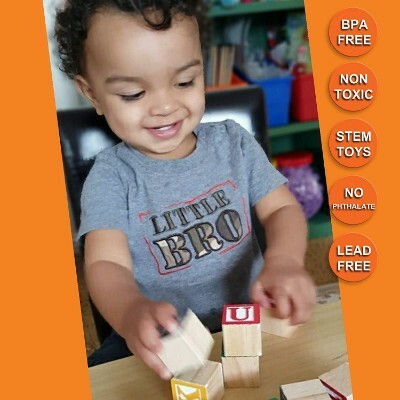 Composed of a high-quality polypropylene these blocks are non-toxic, BPA free, and highly durable. 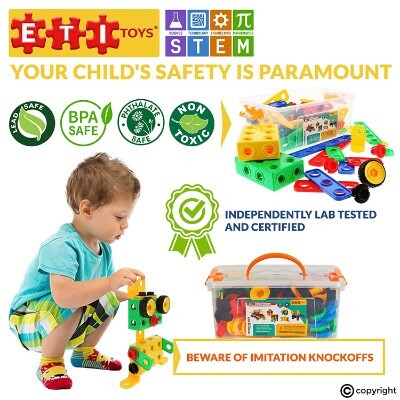 Not only will your child be completely safe from harmful chemicals when playing with the blocks but they have been made durable enough to allow your child to enjoy them for years to come. 6 months to 2 years old. As your child links the pieces together they will be developing their hand-eye coordination as well as their fine motor skills. The brightly colored pieces will stimulate their imagination and motivate them to unleash their creativity as they construct original pieces. The reusable bag makes it easy for you to transport these blocks from place to place. The unique shape of these blocks makes it possible for your child to build whatever their imagination stirs up. With the blocks being nontoxic and BPA free, they’re safe to let their creativity shine for hours on end. These toys aren't made for longevity, but they're varied, well-priced, and easy for children to grasp and use. 30 Months - 8 Years. 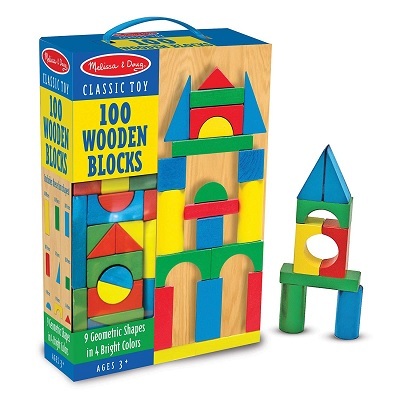 This 100 piece set includes blocks in nine different shapes and four different colors. Children will not only get to exercise dexterity, motor skills, and problem-solving but also sorting and basic shapes and colors recognition. These blocks can be constructed any which way! The sky's the limit and children can build whatever they want with these funs shapes and colors. This set of building blocks is both fun and educational. The open-ended concept allows your child to creatively construct new designs as they grow. These building blocks promote learning in engineering, technology, mathematics, and science. Two wrenches are included in the set, so your child can increase their social and teamwork skills by building with their friends. Your child will become more organized as they work to fit each piece back inside the bin when they’re done playing. The open-ended design of these blocks encourages problem-solving and creative play. 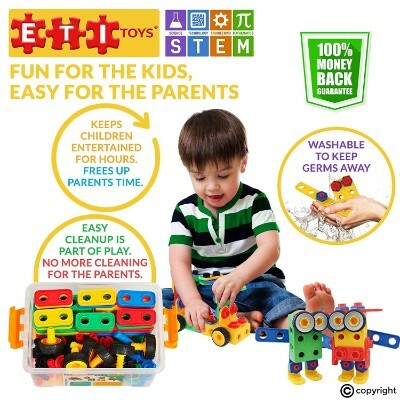 The opportunity for fun is endless with the ETI toys construction engineering building block set. Equipped with 101 pieces, children as young as three can use these pieces to develop their own creations. If they need a little inspiration, a step-by-step instructional book is included in the set and will provide them with 12 different toy designs. 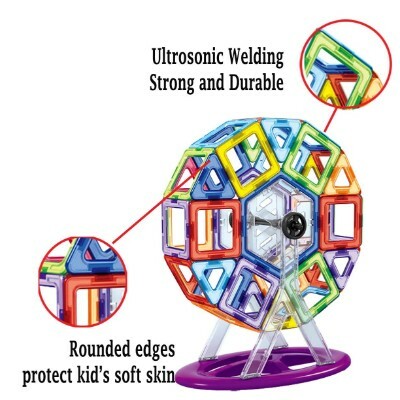 The suggested toy designs range from easy, intermediate, and advanced levels. Your child will never grow out of or bored with this toy as they always have the chance to construct something new. 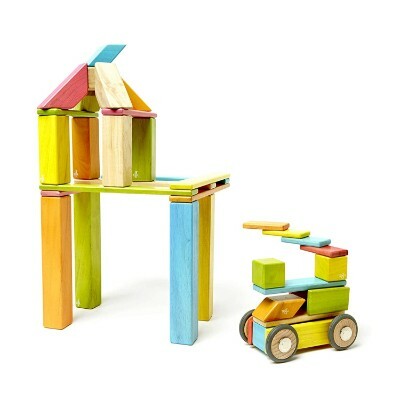 Each piece is non-toxic so your child is safe to build as much as they want. After your child is done playing with the blocks, wash them off in the sink to keep them from collecting germs. All of the pieces arrive nicely packed in a clear box. The box locks securely and is designed with a carrying handle to make storing and transporting stress-free. With a total of 66 pieces of fully magnetized building blocks, Manve’s Magnetic Building Blocks is an excellent take on a timeless block building classic. It comes with a clear container to help with storage and organization. Everything – the squares, circles, semicircles, triangles, and others – is made of high grade, safe, and durable materials. 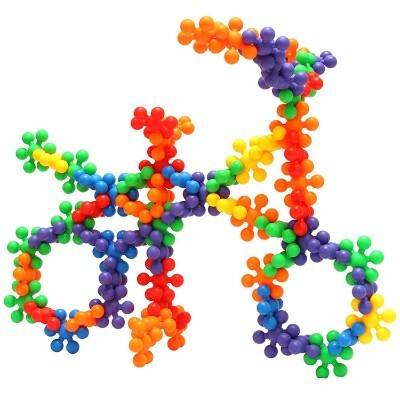 The two shapes included in this set will encourage your child to use their imagination to create cool structures. With only triangle and square shaped blocks, your child is also provided with a bit of a challenge in creating whatever object they want to build. n constructing or building a particular structure. Great for reinforcing motor skills, too. The Newisland 40-Pcs Magnetic Blocks set will help your child to develop their creativity and teach them building skills. This toy block set helps your child develop their spatial and fine motor skills as they learn how things relate and fit together. 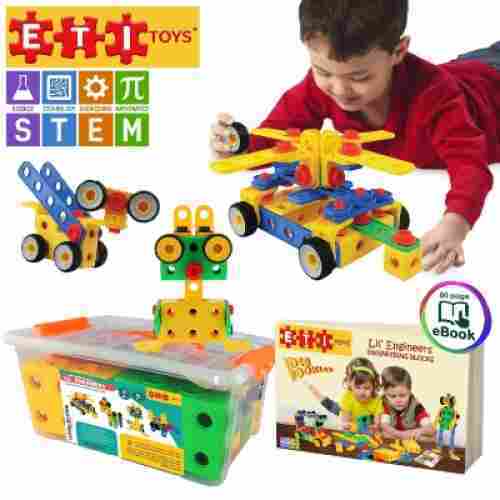 This toy block set is perfect to introduce your child to basic engineering and basic science as they learn how to build things and understand how magnets work. 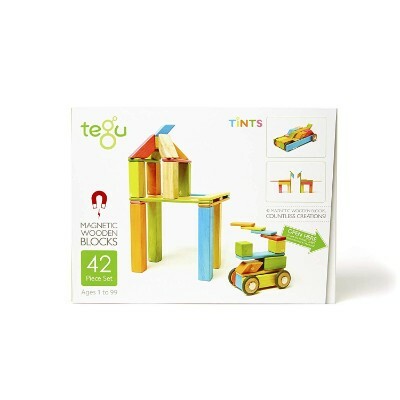 The toy block set comes in a high quality built, various colors and will help to enhance your child's creativity as they discover new ways to create beautiful toy block masterpieces. Could be too big for some toddler hands. 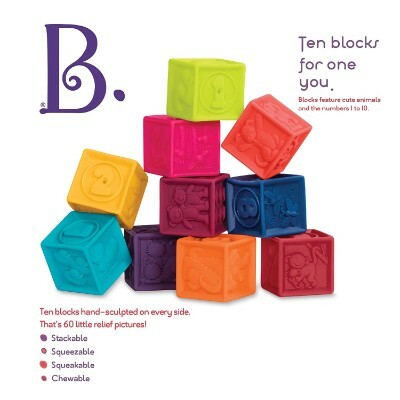 With 10 colorful soft blocks complete with fully embossed images of fun and friendly animals, the B. One Two Squeeze Blocks is sure to delight toddlers as they can literally create miniature colorful towers with the blocks. 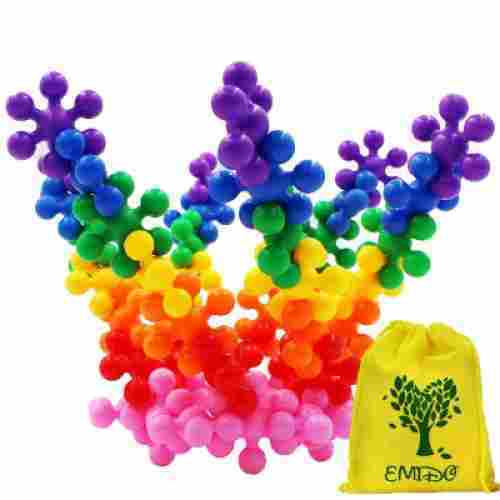 The set can be conveniently stored in a carrying bag made of 100 percent recycled polypropylene. The blocks are buoyant so they can make excellent bathtub toys. 6 months to 3 years old. It is a great way to help toddlers master the art of stacking blocks in different configurations. The different blocks can also help toddlers gain mastery of the different colors as well as the different animals embossed on the blocks. 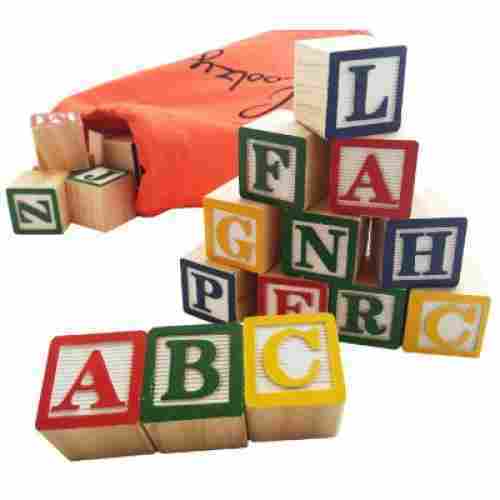 The unique material used for these blocks allows your child to manipulate them in a way that is not possible with regular wooden or plastic blocks. Kids respond strongly to strange textures and surfaces, and because these can be squeezed, your child will be delightfully entertained for hours on end. Give them something different to explore with this popular set. For something truly different that combines the best of science and imagination, look no further than this incredible set. It happens to be a bestseller on Amazon with an almost five star rating, so don’t miss this one. 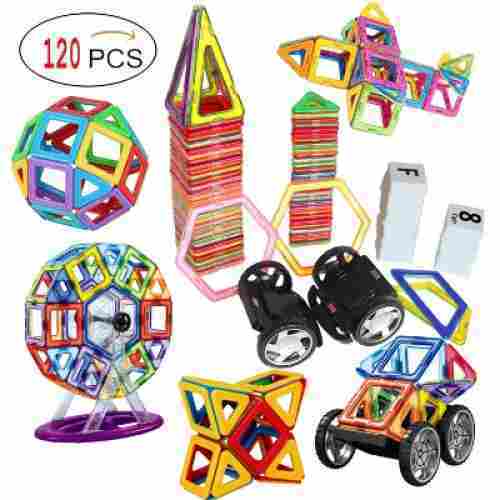 Designed for children three and up, this brightly colored magnetic set comes with an amazing 102 pieces to ignite your child’s curiosity. It also features several different shapes that are easily joined together to make one-of-a-kind structures. 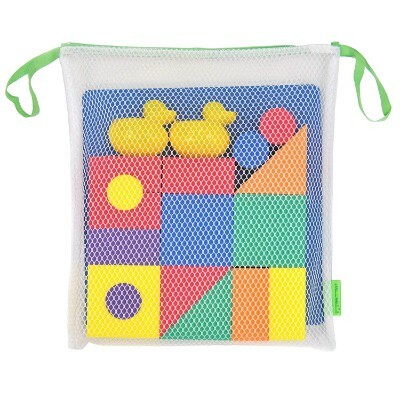 The variety of shapes included in the bag will provide your child with a better understanding of the world around them. Learning shapes early on will help your child improve in math, science, and writing as well. Kids need to feel independent and that they are capable of coming up with their own ideas. These magnetic blocks give your child the ability to make their own decisions when it comes to the design and building strategy of a new structure. This is a critical part of improving a child’s confidence in their own thought processes and creative strategy. Some shapes might not stick well. The magnets inside these blocks take building to the next level. 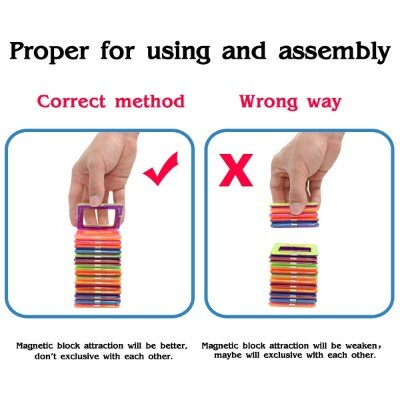 The strength of the magnet adds stability and durability to all of the structures your child creates. Each block is decorated with a unique shade of color that will make each structure look cool. At least 1 year old. 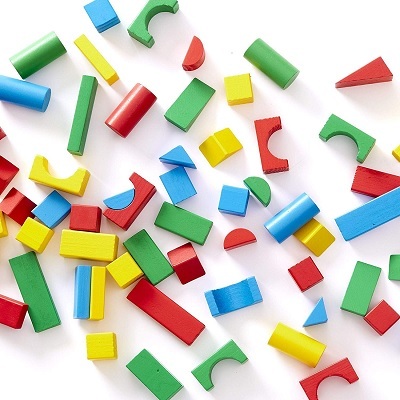 Help your child get a head start on their developing spatial skills with this magnetic set. Because this set uses magnets, it has the potential to be built into awe-inspiring structures that regular wooden blocks just can’t do. These unique designs are an excellent way to enhance spatial recognition in young children. 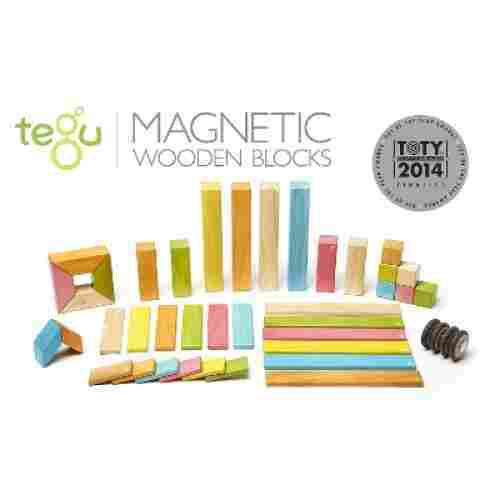 Made of 42 pieces of colorful, naturally safe, and elegantly finished wooden blocks fully integrated with magnetic elements, Tegu’s 42-Piece Magnetic Wooden Block Set will be the perfect gift for kids. 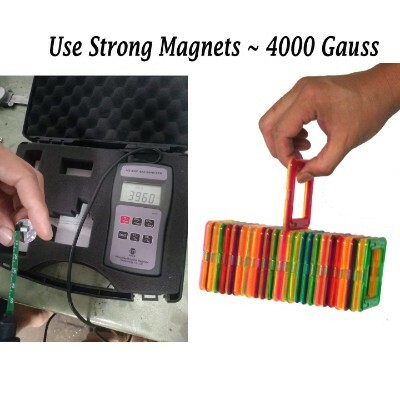 Compared to other types of building blocks, it uses the power of magnetism to connect one block to another without the need to lock the pieces together. The set comes in 9 unique shapes and is available in 5 different variants including natural, blues, sunset, jungle and tints. This next set of building blocks is an oldie but goodie. 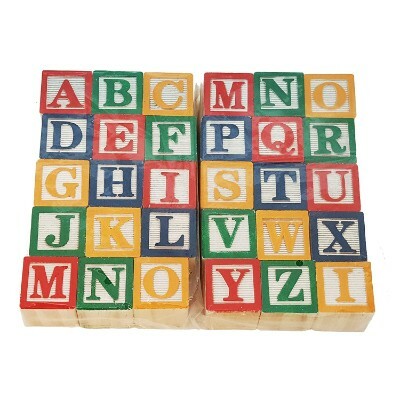 Skoolzy’s set of 30 wood alphabet blocks is perfect for your toddler. 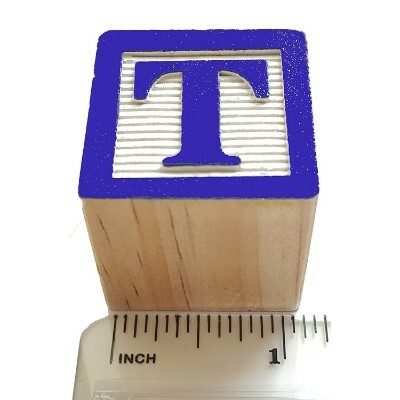 Each one-inch wood block features four blank sides and two sides with different letters. The size of the squares makes these blocks fit perfectly in small hands. The textured wood behind each letter will increase your child’s sensory development. A bright orange Skoolzy bag is included with the blocks to make storage, clean up, and toting easy. Composed of real wood, these blocks are durable enough to survive countless years of stacking. These large blocks can give a boost to your child’s fine motor skills as they carefully stack them on top of one another. Not only will these blocks provide your little one with tons of fun, but they will also stimulate several areas of development. The colors on the blocks will increase your child’s color recognition skills and can even be used to improve their sorting skills. As they stack and build with the blocks they will be improving their fine motor skills, hand-eye coordination, and dexterity. The letters will help your child become more familiar with the alphabet and will help them excel in reading and spelling. While blocks are usually meant for the younger crowd, a 3-year-old isn’t necessarily going to play with a toy that a 7-year-old will play with. Blocks are a toy that a younger child between the ages of 18 months to 3 years old will play with on a regular basis, and it helps with your child’s development. Block toys can be easily played with by children of all ages of course and they can also incorporate different uses. However, toddlers who play with building blocks develop pattern recognition whereas an elementary child playing with blocks can develop their creative skills. When dealing with finding the perfect toy for your child to help develop their fine-motor skills, block toys are especially wonderful. Blocks require regular use of a child’s fingers and hands which will help develop their fine-motor skills by teaching them how to pick them up, grab blocks and even begin holding multiple blocks at once. 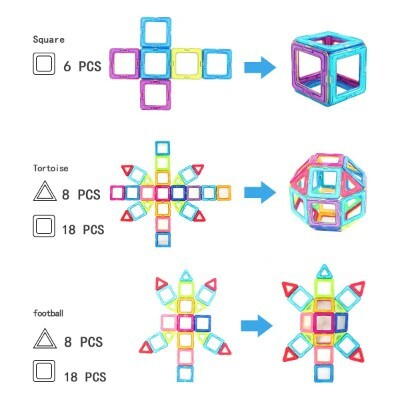 With this ability, it also connects with spatial relation skills wherein block toys will help teach your child how everything fits together. We’ve talked about creativity and fine motor, but what’s left is your child’s cognitive development. Block toys can help your child learn and develop sustained attention, cognitive flexibility and control, category formation, and pattern recognition. 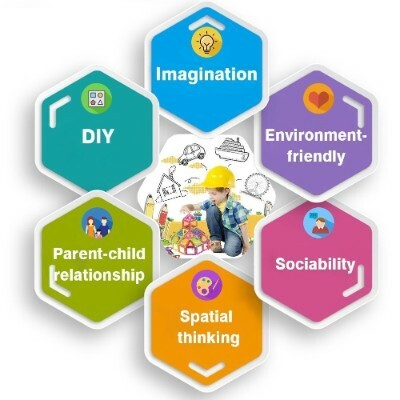 These abilities will not only help them in knowing how to play with toy blocks, but it can also help them with any learning skill in the future. Quite often, toys that help offer a variety of different options of play are considered “open-ended” toys. This means that open-ended toys give a child many different ways to play with their objects. 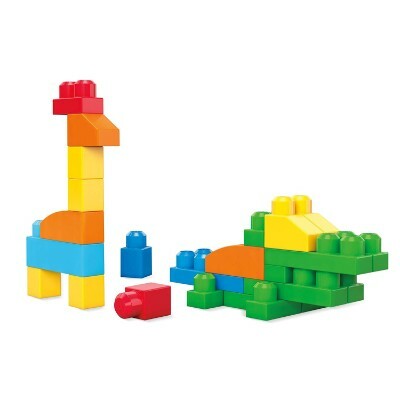 When using building blocks, these toys can create a bridge, zoo, or complete fantasy town. Variety/open-ended toys can help spark your child’s creativity through pretend play while also developing their logical and problem-solving skills. Creativity plays a big part when it comes to playing with blocks. 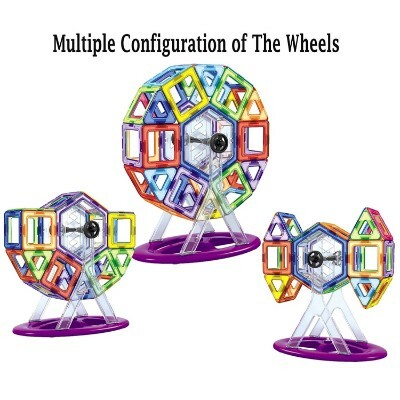 Your children are going to use these toys with their imaginations, which utilizes your child’s creativity. This helps your child develop their intellectual, physical, emotional/social and communication abilities as they grow older. This is incredibly important for children because block toys are an essential beginners’ tool for creativity, especially through pretend play, and they can even help your child build their language and story-telling, problem-solving and even artistic skills. Children from the age of 18 months to around 3 years old are known to be little explorers. They are literally discovering a lot of new things in their surroundings, such that they are now finding it increasingly important that they establish themselves as individual persons. While they may seem to exert their beliefs in certain things, experts believe that they still cannot find the most appropriate way to express their thoughts and feelings. It is for this reason that many parents consider toddlers as defiant, often throwing temper tantrums in public spaces as a way of getting attention and telling his or her caregiver that he or she wants something. Unfortunately, this may not necessarily be the case all the time. Because their language is still quite limited and they don’t know how to express their thoughts, they get easily frustrated. And this manifests as temper tantrums. Building block toys can help in this sense especially if the toy comes fully integrated with learning activities like shapes, colors, the alphabet, numbers, and simple phrases. Additionally, because building blocks allow for open-ended play, it stimulates the minds of toddlers to think creatively and imaginatively. Studies have shown that, compared with puzzle toys, building block toys allow for the development of divergent problem-solving skills. This simply means that there is a multitude of solutions to a single problem. When taken in the light of toddlers’ frustrations for failing to express themselves, building block toys allow them to explore other ways in which they can convey to their caregivers what they really want. Toddlers will attempt to look for other ways in which they can communicate their needs to their parents and not just by throwing tantrums. Block toys are considered play-based on the numerous problem-solving skills that your child can create with them. Toy blocks help your child develop creative thinking abilities that can help solve divergent problems. Divergent problem-solving isn’t exactly the sole focus of blocks, however, all kinds of simple and complex problem-solving can still be learned with them. q: What are toy blocks? 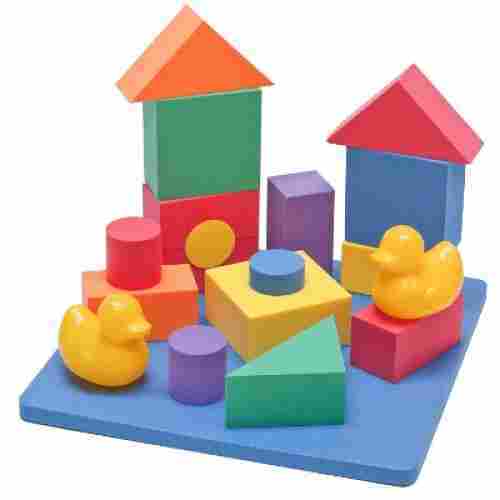 Toy blocks are toys developed from various materials (Wood, plastic, and foam being the most common) that are crafted into various shapes and colors. The purpose of toy blocks is to engage a child’s mind to help develop critical skills for their physical, social, intellectual, and creative benefit. Toy blocks are also known as building blocks and can sometimes be categorized as construction toys. q: Why are toy blocks important for kids? Toy blocks are important for children because they help to develop children in multiple ways. Such development includes cognitive development, motor-skills development, team player skills, creative skills, and even social/emotional skills. Virtually every skill and ability your child has to use as they become older and interact with the world can be learned and developed from playing with toy blocks. q: What are the benefits of toy blocks? q: What can a child learn from toy blocks? q: What kind of toy blocks are there? 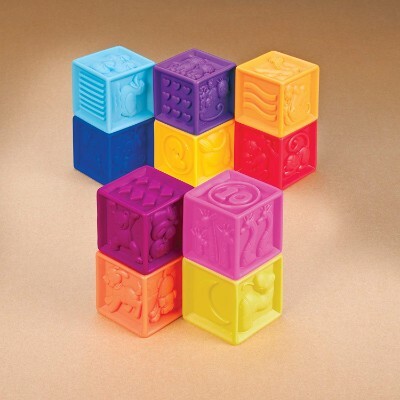 There are a variety of toy blocks for children to play with. Wooden, plastic, and even metal toy blocks are available. For children, however, the best choice is toy blocks made from fabric, foam, other soft materials, plastic, and wood. 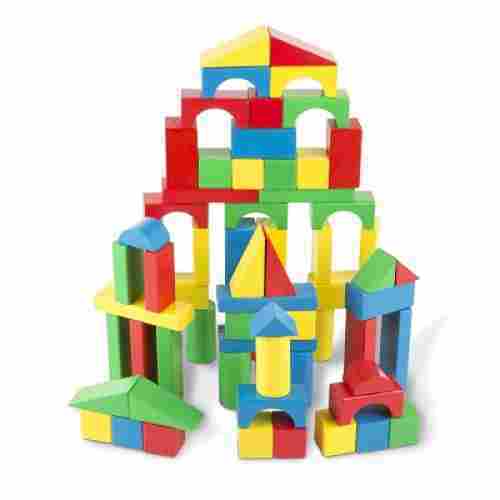 Other variety criteria of toy blocks include color, shapes, textures, and sizes. Theme or usage focused toy blocks are common as well and you can also purchase toy blocks with a focus on educational and STEM training. q: How else can I discover toy blocks? 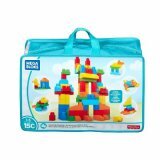 You should start with the Born Cute “10 Best Toy Building Blocks for Toddlers in 2019” list: Click the link of the toy block that interests you and when you arrive at the Amazon page for the toy block, scroll down to the “Customers Who Viewed This Item Also Viewed” or “Customers Who Bought This Brand Also Shopped For” lists. Those two lists can give you a great starting point in discovering other toy blocks.